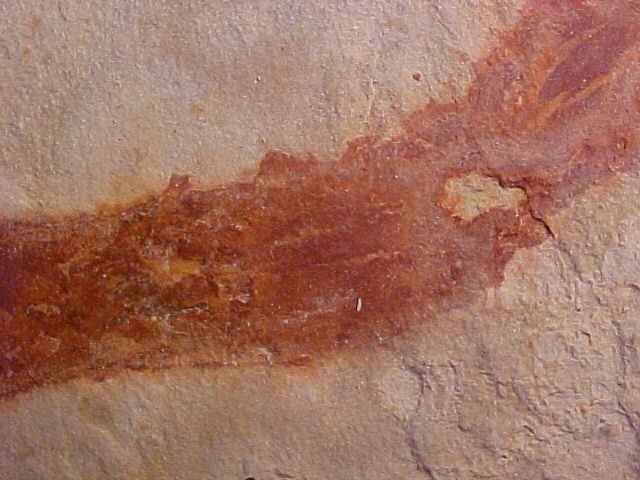 The first fossils of multicellular green algae appear in the Cambrian strata of the early Paleozoic Era. Margaretia as shown here was a thin, frond-like green, carbonaceous algae resembling modern kelp. 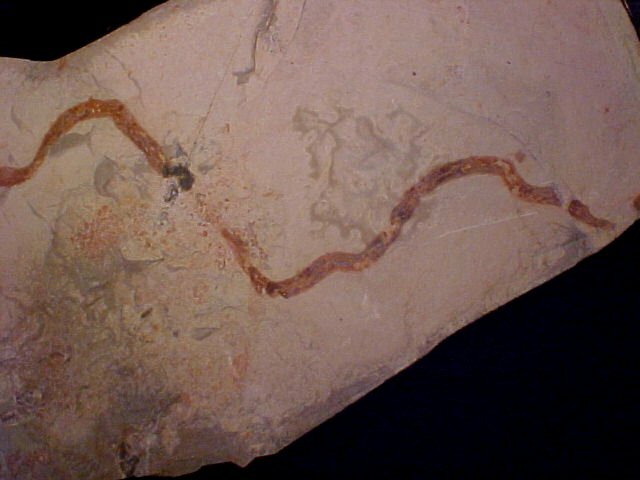 Complete Margaretia dorus fossils as seen here have also been found in the Burgess shale of Canada and are classified as Chlorophytes, a distinct branch of green algae from the Streptophytes that eventually gave rise to the land plants. Although Briggs book (see reference below) shows up to three fronds growing from the base, the Utah fossils seen to only have single and double fronds attached to the base. A network of small oval holes perforates the fronds. A few scientists believe Margaretia were a type of sponge or alcyonarian coral. Margaretia are one of the more common megascopic algae in the Wheeler and Marjum Formations, but they are usually poorly preserved and rarely found in the size and having the contrast of this specimen. 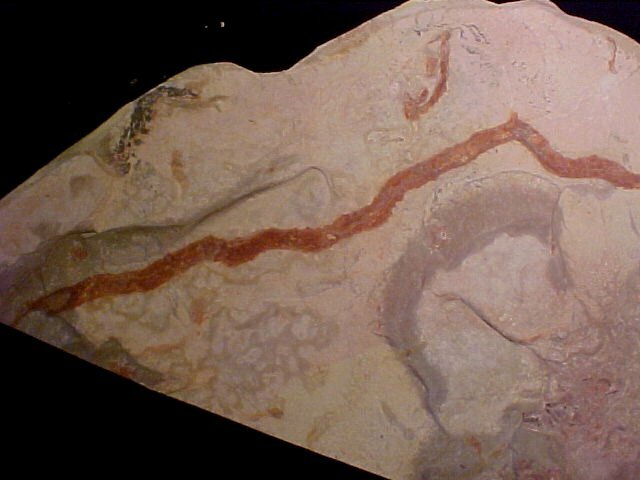 Actually, together with filamentous cyanobacteria (commonly called blue-green algae), algae like Margaretia built large reef systems that not only supported Cambrian marine life, but photosynthetically augmented atmospheric oxygen levels thus further driving the amazing eukaryotic diversification known as the Cambrian Explosion. This specimen ranks among the largest Margaretia ever found, and demonstrates that the kelp-like fronds could be very long. 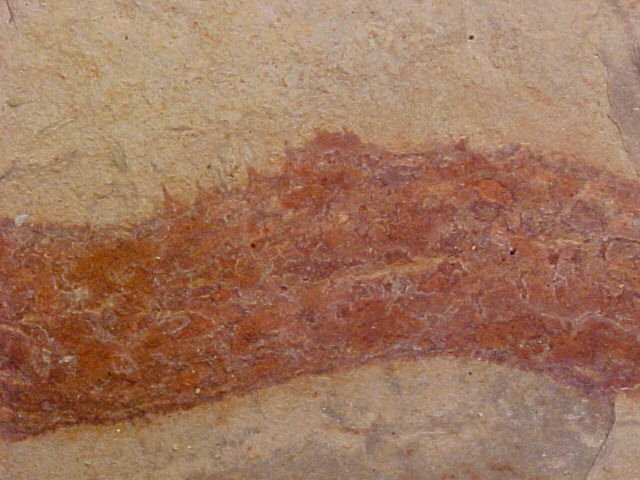 Pictured is a section of the specimen showing a ruffled, sometimes spiny edge, a detail that usually is not perserved. Reference: The Fossils of the Burgess Shale - D. E. Briggs, et al.